Charlton’s late-night stop-outs are set to get a weekend night service on bus route 486 when the Night Tube service starts this September, according to plans unveiled by Transport for London yesterday. But weekend users of the existing N1 service face seeing their service cut from three buses an hour to just two, if TfL’s current scheme goes ahead. TfL is altering the night bus network so it complements the Night Tube, which is due to begin on 12 September. At least six trains per hour will run in the small hours of Saturday and Sunday mornings across the Jubilee Line, with night services introduced on routes 132 and 486 to serve passengers at North Greenwich alongside current 24-hour routes 108, 188 and 472. 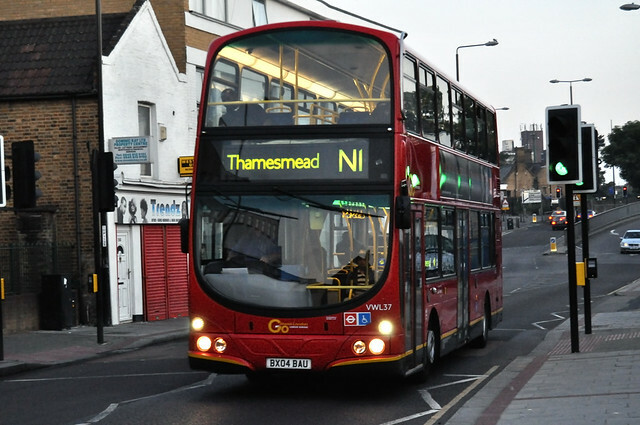 The 486 will get a half-hourly service across its full route through Greenwich Millennium Village, Charlton, Shooters Hill and out to Bexleyheath. But route N1, the existing night service linking Tottenham Court Road with Deptford, Greenwich, Charlton, Woolwich, Plumstead and Thamesmead, will be less frequent at weekends. It currently runs two buses an hour on weeknights and three at weekends. This will drop to two under the plan, which also sees it run via Evelyn Street in Deptford rather than serving the Pepys Estate, which gets a new N199 service. Presumably TfL feels fewer people will use the N1 once the Night Tube begins, but the bus still picks up large numbers of people outside the West End, particularly at Elephant and Castle. The cut also penalises shift workers who will still depend on the service running in the other direction. There are no changes planned to the area’s other night routes, the 24-hour 53 to Plumstead and the N89 to Erith. One trick that Transport for London may have missed is in route 132, which is due to run fast via the Blackwall Tunnel approach to the Sun-in-the-Sands roundabout – as it does during the day – rather than via Westcombe Hill and Blackheath Standard, which would make it more useful to many passengers from Charlton and Blackheath. To see the full proposals and to comment, visit Transport for London’s website.